Our range of products include Employee Self Service such as Online, On Demand Access Payroll Software, Payroll Software, Help Desk and Manager Self Service. Minimize HR work by empowering employees with self service options. Employees can see the Company Holidays, their Leave balances, transactions and team leave calendar. Workflows for applying leave, cancellation, compensatory off grant, leave encashment, etc. are available. 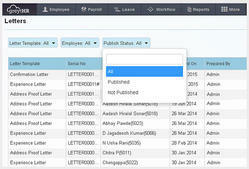 With the ESS features, the employee can initiate leaves requests, expense claims, etc. at their convenience and with no intervention. This in turn, leaves the HR free to focus on more pressing matters. Managers can now view their team members' data anytime, anywhere. HR will no longer need to constantly keep generating reports. Better information access with significantly lesser effort. With the greytHR ESS feature, the employee can initiate leaves requests, expense claims, etc. at their convenience. They can easily access information related to payouts, income tax, company policies etc. They can view their payslips, total earnings statements, PF and YTD statements. Details related to loans like installments paid, balance payable, etc. can also be viewed without having to wait for HR revert. The managers on the other hand, can now view their team members' data anytime, anywhere. With the ESS features, the employee can initiate leaves requests, expense claims, etc. at their convenience and with no intervention. This in turn, leaves the HR free to focus on more pressing matters. Managers can now view their team members' data anytime, anywhere. HR will no longer need to constantly keep generating reports. Better information access with significantly lesser effort. greytHR offers a great letter generation tool. Work that used to take 10 to 15 minutes can now be wrapped up in under a minute without any mistakes. With greytHR, preparing standard letters is simple and doesn't need any typing at all! Looking for Employee Self Service ?